Nicole Kidman, Toby Kebbell, Tatiana Maslany et al. DVD: 121 min., Blu-ray: 123 min. 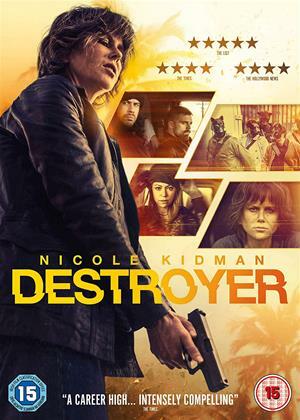 In Karyn Kusama’s riveting new crime thriller 'Destroyer', the receipt of an ink-marked bill in the office mail propels veteran LAPD detective Erin Bell (Nicole Kidman) on a perilous journey to find the murderer and gang leader, Silas (Toby Kebbell), and perhaps to finally make peace with her tortured past. Written by Phil Hay and Matt Manfredi who also produced the film alongside Fred Berger, the epic odyssey through the underbelly of Los Angeles and nearby desert communities reunites Bell with members of the criminal gang she once joined as an undercover FBI agent; an assignment which ended disastrously and has taken a heavy psychological and physical toll on her life. One by one, she tracks down the gang leader’s former cohorts including Petra (Tatiana Maslany), Silas’ onetime lover and current errand girl. During her obsessive search, Bell is flooded with memories of her undercover days with Silas’ gang and her involvement in a bank heist gone tragically wrong. Especially painful are her recollections of Chris (Sebastian Stan), the FBI partner with whom she had a brief but meaningful romance. But Bell’s problems are not confined to the past. She is increasingly at odds with her rebellious sixteen- year-old daughter Shelby (Jade Pettyjohn), from whom she is estranged. Her clumsy attempts to reach out to Shelby consistently backfire, exacerbating Bell’s overwhelming sense of hopelessness and loss. As she hones in on Silas, the demons of her compromised past emerge, and Bell must come to terms with her own culpability in what happened before she can entertain any hope of redemption.